Hungary's fence to keep migrants out Jump to media player Ed Thomas reports from Hungary where thousands of refugees have arrived this year in a bid to make it to other EU countries. 'Train track refugees' cross into Hungary Jump to media player The BBC's Nick Thorpe reports from a train track used by refugees crossing the Serbia-Hungary border. Hungary station 'like a refugee camp' Jump to media player More than 120,000 migrants have travelled through Budapest so far this year - triple the numbers seen last year - with Keleti station now home to thousands of migrants. Migrants escorted off Eurotunnel tracks Jump to media player A Eurotunnel freight train had to stop in the Channel Tunnel after a migrant was seen on wagons bound for the UK. The number of migrants trying to reach Europe is continuing to rise, with many travelling through Hungary in an effort to get into the EU's passport free zone. More than 120,000 migrants have arrived there this year, triple the number in 2014. 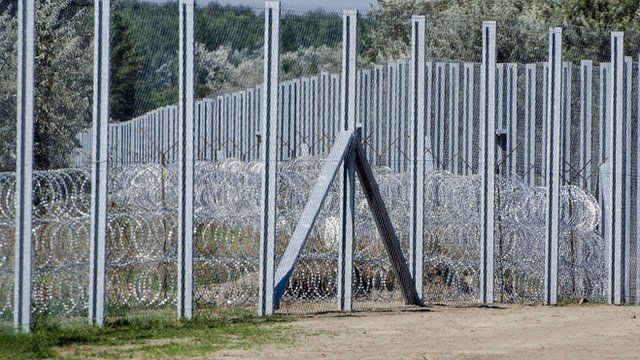 In an effort to stem the flow, the government in Budapest is building a 110 mile long fence along its border with Serbia. Ed Thomas reports from the border between Serbia and Hungary.